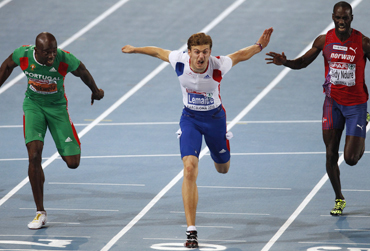 Christophe Lemaitre underlined his standing as the fastest European with victory in an astonishing 100 meters final at the continent's championships on Wednesday. In the narrowest of photo-finishes, the next four athletes were all given the same time but there was no denying the Frenchman his gold. 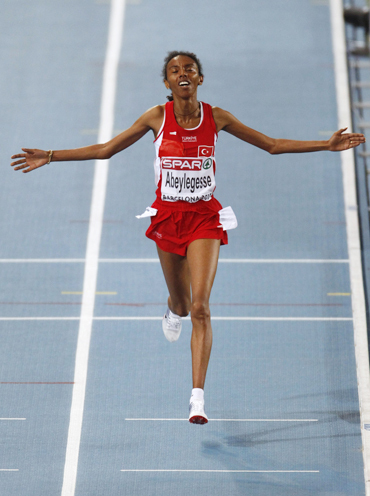 By contrast, Turkey's Elvan Abeylegesse enjoyed a clear-cut win in the women's 10,000 meters, destroying the field with her front-running to win by more than 12 seconds. In all, six titles were decided on the second day of the championships. 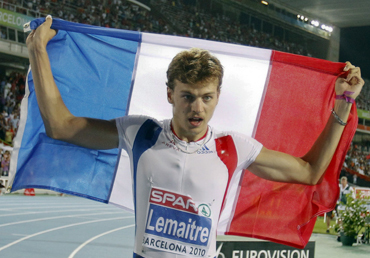 Lemaitre powered ahead over the final part of the 100 after a poor start to win in 10.11. His rivals were also left in his wake after the finish as they had to wait for the decision of a photo finish while the 20-year-old Frenchman enjoyed his lap of honour, soaking up the admiration of the crowd at the half-empty Olympic stadium. After what must have seemed an eternity to the athletes Britain's Mark Lewis-Francis was declared second in 10.18. Frenchman Martial Mbandjock (third), 2006 champion Francis Obikwelu (fourth) and pre-race favourite Dwain Chambers of Britain (fifth) were all given the same time of 10.18. "After a brilliant year my objective was gold," said Lemaitre who went under 10 seconds for the first time earlier this month. "I didn't have a good start in the final but picked up very well on my speed. It was a brilliant final," he added. While the crowd were still buzzing from the result, Europe's multi-eventers took to the track for the decathlon 400 meters knowing their job was only half done. Ukraine's Oleksiy Kasyanov leads by just 20 points after five events from Lithuanian Darius Draudvila. Earlier on the track as darkness started to fall, European record holder Abeylegesse took the first step towards a distance double with her comprehensive 10,000 victory. The Ethiopian-born Turk, who also plans to run the 5,000, set a relentless pace and destroyed the field, which included 2006 champion Inga Abitova of Russia, to win in 31 minutes 10.23 seconds. Abitova moved into second ahead of a tiring Jessica Augusto on the penultimate lap to take the silver in 31:22.83, leaving the Portuguese to settle for bronze. "It was really hard to run because of the wind. I gave everything and finally got my first gold medal," said Abeylegesse, who has won Olympic and world silver medals and who took the 5,000 bronze at the 2006 Europeans. Latvian Ineta Radevica was so happy she wanted to dance after upsetting the form book to win long jump gold from Portugal's Naide Gomes by virtue of a better second-best distance. Both athletes leaped 6.92 meters but Radevica's next-best effort was 6.87 compared to 6.68 from Gomez. "I actually feel like dancing but I have the triple jump qualification tomorrow so I'm going to try and keep my emotions under control," the 29-year-old Latvian told reporters. Russian Olga Kucherenko, the top-ranked European this year was third with 6.84 and 2006 champion Lyudmila Kolchanova fifth. Former world and Olympic heptathlon champion Carolina Kluft, who missed 10 months through injury, finished 11th with 6.33 after scraping into the final as the last qualifier. 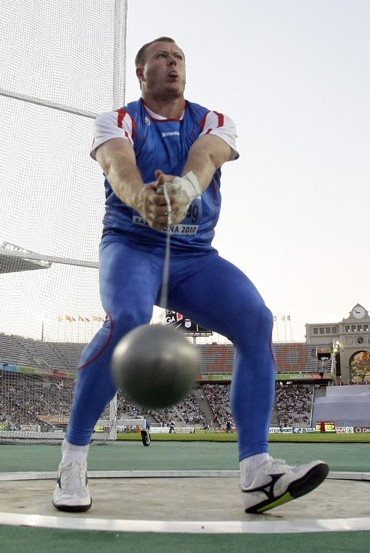 Libor Charfreitag won the men's hammer with the only throw over 80 meters. The 32-year-old Slovakian threw 80.02 on his second trip into the circle. Italian Nicola Vizzoni added the European silver to his Olympic one with 79.12, six centimetres more than Hungary's Krisztian Pars. Croatia's European junior discus champion Sandra Perkovic grabbed the senior title with her final throw to deny world bronze medallist Nicoleta Grasu victory. The 38-year-old Romanian had held the lead since an opening effort of 63.48 only for Perkovic to better that with 64.67. Olympic and world champion Olga Kaniskina burst into tears after leading a Russian sweep of the medals in the day's opening event, the women's 20-km walk. Kaniskina led compatriot Anisya Kirdyapkina by 10 seconds at the halfway mark and continued to pull away from the field to win in a time of one hour 27 minutes and 44 seconds. Kirdyapkina, fastest woman in the world this year, was one minute and 11 seconds behind. Vera Sokolova was third.